Crumlin (Irish: Cromghlinn, meaning "Crooked Glen") is a Southside suburb of Dublin, Ireland. A densely populated residential area, with some industry, it is also the site of Ireland's largest children's hospital. Crumlin covers the area from the River Poddle near the KCR (Kimmage Cross Roads) to Sundrive Road and Crumlin Cross at The Submarine Bar to Crumlin Village and the Drimnagh Road, to Bunting Road, Crumlin Road then along the Grand Canal from Rialto Bridge to Sally's Bridge. It is situated near to the city centre, on the Southside of Dublin city. Neighbouring areas include Walkinstown, Perrystown, Drimnagh, Terenure, and Kimmage. Crumlin is contained within postal district Dublin 12. 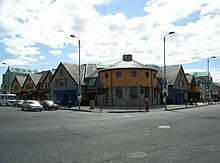 Crumlin gets its name from the crooked valley known as Lansdowne Valley. The valley was formed by glacial erosion in the distant past and is now bisected by the River Camac. The valley depending on your point of view is situated in front of or behind Drimnagh and is largely made up of good quality built houses with lots of recreational parkland. During the medieval period, Dublin was surrounded by manorial settlements comprising church, graveyard, manor house, motte and bailey, farms and cottages. These settlements grew into a network of villages around Dublin creating stability and continuity of location. Crumlin Village developed as an Anglo-Norman settlement soon after the Norman Conquest in 1170, (although the circular configuration of the old graveyard of Saint Mary’s in the village suggests pre-Norman associations), and has survived through the centuries to become the village of today. The Old Saint Mary's Church stands on the site of a 12th-century church of the same dedication, and a succession of churches occupied the site down through the centuries to the present day. The graveyard in st Mary's is the resting place of the earliest recorded deceased china man in the dublin 12 area, a sailor who came here ib the 17th century. In 1193, King John (the then Prince of Moreton) gave the Crumlin church to form one prebend in the collegiate church of Saint Patrick. When the main body of the present old church was rebuilt in 1817, the old tower of a much earlier origin was preserved. Crumlin, along with Saggart, Newcastle, Lyons and Esker (Lucan) was constituted a royal manor by King John sometime before the end of his reign in 1216. The English noble families of the time had strong links with Ireland, particularly in Leinster. For example, William Fitz John of Harptree  was a lord of some significance in Somerset and likely to have served in Ireland under King John. At the beginning of the reign of King Henry III, Fitz John acquired the custody of the lands of William de Carew and held the royal manor of Crumlin, although he did not establish family roots in Ireland. As the church was the nucleus of life on the manor in medieval times, we may with confidence place the centre of Crumlin’s medieval settlement in the area of Crumlin Village. This has been confirmed by recent archaeological excavations in the area of Saint Mary’sand the site of the former motte and earthworks on which the new St. Mary's Church was built. St. Mary's Church, Crumlin Village, Dublin - South East View. Some of the local amenities in Crumlin, such as Pearse College on Clogher Road and Ceannt park, are named after some of the 1916 Rebels who had a training camp in nearby Kimmage at Sundrive crossroads. Crumlin is home to Our Lady's Children's Hospital, Crumlin, the largest children's hospital in the country. A great many roads are named after some of Ulsters towns and various Irish towns associated with pagan or religious sites/towns. There's a statue of the warrior Cúchulainn situated opposite St. Mary's Church at the junction with Bunting Road. He is said to have originated from the area (this bit is not true). The statue is for Oisín, he was a Kildare man who played hurling in the Crumlin area. Cúchulainn his father was from the Cooley mountains around louth, South armagh where the Cooley Road in Drimnagh gets its name and is described as a partially wooded landscape, the crooked glen being one of its main features. Today this valley can be seen behind Drimnagh Castle and was wild until recently turned into a golf course, albeit one that did not ruin its features but tried to use them in the main. Brendan Behan moved to Crumlin from Dublin City Centre. He lived at 70 Kildare Road where the house is marked with a plaque in his honour. Christy Brown, the Irish author, painter and poet, was born in Crumlin. Paddy Casey, the singer/songwriter, is from Cashel Road in Crumlin. Martin Cahill, a Dublin underworld figure, lived in Crumlin. Gemma Craven, the actress, is from Crumlin. Joseph Deane (1674–1715) politician of the Irish House of Commons, judge, Chief Baron of the Irish Exchequer, and owner of the Crumlin estate was born in Crumlin. Martin Duffy, filmmaker and author was from Leighlin Road, Crumlin. Duffy based his first feature film The Boy from Mercury on his childhood experiences in the neighborhood, and detailed life there from the 1930s onwards in the biography of his parents, "Barney and Molly". Richie Egan, bass player in The Redneck Manifesto (band) and lead singer of Jape (band), is from Crumlin. Seamus Elliott, cyclist, was a stage winner in the Giro d'Italia in 1960 and the Vuelta a Espana in 1962. He also won a stage in Tour de France and held the Tour's yellow jersey for 2 days. Liam Lawlor, the high profile and controversial Irish TD, was born in Crumlin. Paul McGrath, the former footballer who played with the Republic Of Ireland, Manchester United and Aston Villa, grew up in Crumlin having played for St. Patrick's Athletic of Inchicore. Conor McGregor, a mixed martial artist fighting in the UFC and former UFC Lightweight Champion. Noel Pearson, theatrical and film producer, is from Crumlin. Fintan O'Toole, journalist and Irish Times assistant editor, grew up in Crumlin. Andy Reid, Sunderland AFC player. Andy grew up on Clogher Road in Crumlin. Eamonn Rogers, the former footballer who played with the Republic of Ireland, Blackburn Rovers and Charlton Athletic. Crumlin GAA – based in Pearse Park, with its clubrooms in O'Toole Park. Kevin's GAA - based in Dolphin Park. Templeogue Synge Street GAA - based in Dolphin Park, with clubrooms in Bushy Park. Guinness Rugby Football Club – based at the Iveagh Grounds. Crumlin United F.C. – a senior football team from the area. St James's Gate F.C. – play their home games at the Iveagh Grounds. Lourdes Celtic F.C. – a junior football team from the Sundrive area, they play in the Leinster Junior Leagues. Damien Duff and Andy Reid played for the club. Crumlin Boxing Club – based in Windmill road and produced Dean Byrne. St James Gaels – another GAA club in the area. They play their home games at the Iveagh Grounds. Crumlin Bowling Club – based on St.Mary's Road. It was originally part of the Imperial Tobacco Company from 1926 to 1947. The Crumlin Bowling Club was founded in 1947 and is still one of the premier bowling clubs in Ireland. Main Stage Wrestling Academy – based on Sundrive Road, this is one of the top and best professional wrestling schools in Ireland. When the RTÉ drama Fair City launched in 1989, exterior shots were filmed in the Crumlin-Drimnagh area for the first three seasons of the programme (1989–93) until season four launched in 1994, the year the set in RTÉ, Donnybrook was completed. Locations used were as follows: Entrance road onto Copeland Close - Clogher Road Junction Copeland Close - Saul Road Ragnall Place - Derry Drive Copeland Drive (this is the main location in the series where McCoy's Pub; The hungry pig diner; Vino's and the Spar are located) - Old County Road Carrigstown Garda Station - Garda Station, Crumlin Road Carrigstown Comprehensive Secondary School - St. Kevin's College CBS, Clogher Road Carrigstown Road - Windmill Road In 1994, Replicas of the exterior of the houses used in the series were constructed in the Donnybrook studios. It is still filmed there to this day. ^ Modern East Harptree and West Harptree. ^ "Gabriel Byrne biography". www.celebritypro.com.